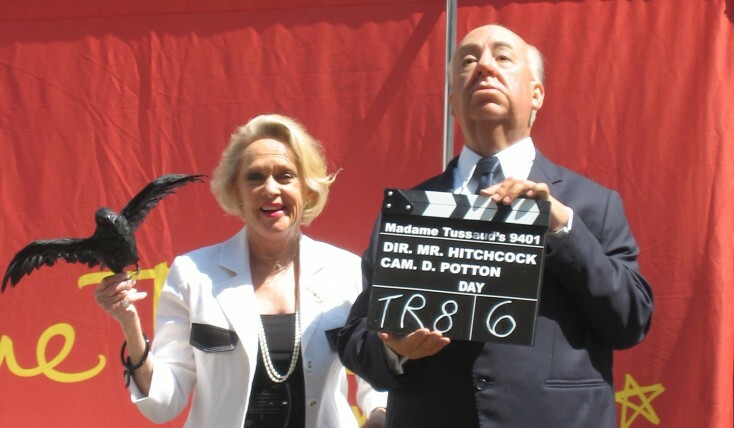 Tippi Hendron poses with Alfred Hitchcock. ©Judy Sloane. HOLLYWOOD—In the early ‘60s, Alfred Hitchcock spied Tippi Hedren, an unknown fashion model, on a TV commercial, and was immediately infatuated with her. He brought the gorgeous blonde to Universal Studios and offered her a seven-year contract. The first movie he cast her in was his classic horror film “The Birds.” But for the actress, it was the “horror” behind the camera that she found the most daunting. The director had become totally obsessed with her, hoping to win Hedren’s affection. They made another movie, “Marnie,” together, but when she rejected his advances, Hitchcock made sure her career was destroyed by never using her again, and not allowing other studios to hire her. On Saturday, Oct. 20, “The Girl,” as Hitchcock called all his leading ladies, premieres on HBO with Sienna Miller portraying Tippi Hedren and Toby Jones as Alfred Hitchcock. Hedren spoke at the Television Critics Association about the movie and her relationship with the talented but inscrutable director. Q: The cliché would have been that Hitchcock was just sexually obsessed with you. But the movie makes it seem like something deeper than that. He seemed to give all kinds of spiritual qualities to you, that he had almost a mystical adoration of you. 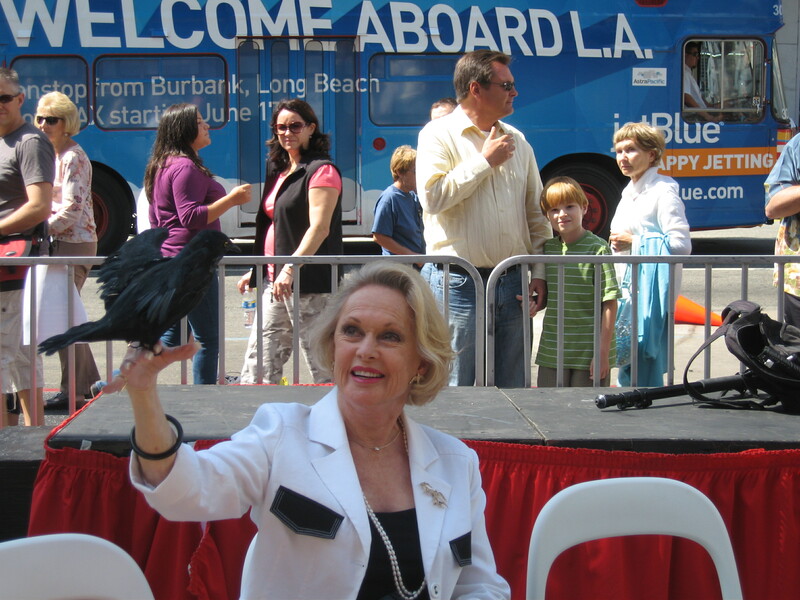 Hedren: It was something that I had never experienced before. I don’t know what to call it. People have said, “Was he in love with you?” No, he wasn’t. When you love someone, you treat them well. I think we’re dealing with a mind here that is incomprehensible, and I certainly am not capable of discerning what was going through his mind or why. I certainly gave no indication that I would ever be interested in any kind of a relationship with him. Q: What was it about your nature that you were able to not give up and work through it? Hedren: As “The Girl” is an hour and a half, there wasn’t enough time to give examples of what other experiences were in existence during the Hitchcock/Hedren years. There were times when it was absolutely delightful and wonderful, the times that we spent while he was my drama coach. I hadn’t any acting experience except in commercials. (So) it wasn’t a constant barrage of harassment to me. There were times of joy. Q: In the movie, Alfred Hitchcock comes off as a really sad and despicable figure. Do you think that’s accurate? Hedren: I think he was an extremely sad character. As I said in the beginning, we are dealing with a brain here that is unusual, genius and evil, deviant almost to the point of dangerous because of the effect that he had on people that were totally unsuspecting. Tippi Hendron befriends a crow. ©Judy Sloane. Q: Did any other of Hitchcock’s leading ladies, Kim Novak, Grace Kelly, confide in you? Hedren: I know Kim Novak, and she never said a word about anything wrong. I didn’t bring it up. I really didn’t talk about this issue for such a very long time. This manifestation happened during the latter part of filming “The Birds”, and I remember Suzanne Pleshette saying to me, “It isn’t always like this.” As far as I know, Vera Miles had a terrible time with Hitchcock, and she wanted to get out of the contract. He didn’t let her. She did “Psycho,” and I believe, if you look at “Psycho,” there isn’t one close-up of Vera, not one. And after that, she would never even speak about him to anyone. Q: Were you apprehensive about seeing the movie? Hedren: I was apprehensive. I knew pretty much what the film was going to be like because Gwyneth Hughes, the writer, honored me by coming to talk to me at the Shambala Preserve (Tippi’s wildlife domain) about the script. So I felt good about it. Sienna also came to the Shambala Preserve, and we were able to spend a couple of hours talking, and at least one hour solidly where I tried to give her the information about my upbringing and where that core of strength comes from. Q: What did you think of Toby’s portrayal of Hitchcock? Q: Not to blame the victim, but why didn’t you speak up about this before? Hedren: All those years ago, the studio had power and there was absolutely nothing I could do legally. There were no laws about this kind of a situation. If this happened today, I would be a very rich woman. Q: Do you still feel traumatized by your experience with Hitchcock? And do you have any advice for young actresses who might be in similar situations? Hedren: I hope that young women who do see this film know that they do not have to acquiesce to anything that they do not feel is morally right, that they can have a strength (about it). Q: What helped you cope with this situation? Hedren: My whole life began with the education that my parents gave me through the background of my Lutheran teachings, and all of those teachings served me very well throughout my life. I can look myself in the mirror, and I can be proud. I feel strong. I lived through it beautifully. He ruined my career, but he didn’t ruin my life.